Sacred Heart Primary School is a parish primary school that provides a Catholic education to the families of Sacred Heart Parish, Croydon. Education in religion and faith is our starting point. 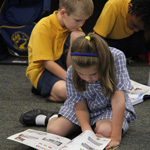 Our curriculum is underpinned by the Victorian Curriculum which focus' on developing fundamental knowledge, skills and behaviours in literacy and numeracy.